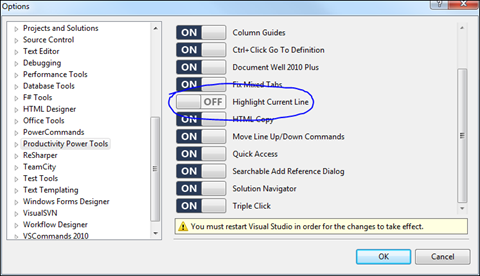 Are you experiencing that VS2010 is suddenly highlighting the current line in the text editor? Do you want to get rid of it? I’ll show you how – or maybe convince you to keep it! 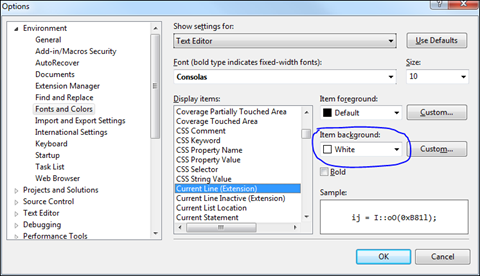 This is not part of the default functionality in VS2010 so most users never see this. 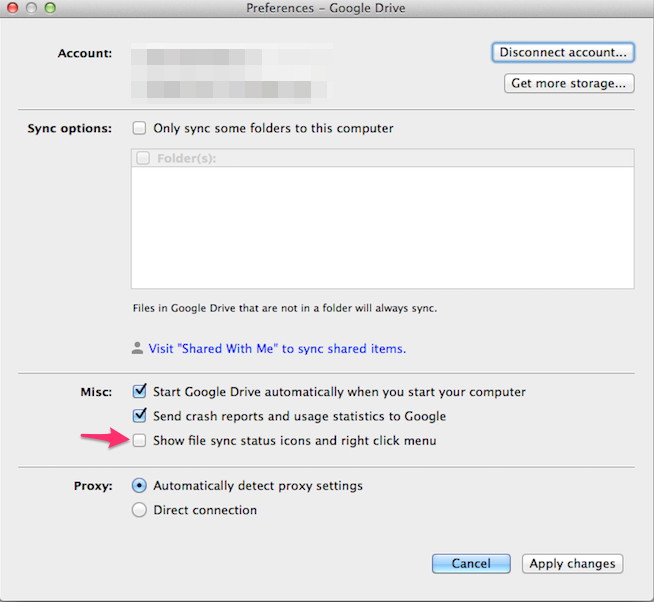 However, if you happen to install the Productivity Power Tools it will be enabled by default. The idea is that highlighting the current line will make it easy to see where your cursor is when you have a large monitor and get lost. Some users probably love this feature. Personally I don’t like it at all when my cursor “taints” the current row like this when I’m editing. I find it plain annoying! Now if that was all I had to say this wouldn’t be a useful blog post. Let’s see what we can do! Instead of turning it off we can make better use of this feature. I actually think it is a very good idea to show where the cursor is. However, once I have found the place and start typing the highlighting is just in the way for me. I have set the active color to White which means that when I’m in the edit window and typing the highlighting is hidden. When I navigate classes in the Solution Explorer or elsewhere it will light up. This will effectively work very nicely because when I’m working with other panels or windows and returning to the edit window I can find where I was pretty quickly. Line highlighting is a pretty controversial feature. Some swear by it and some curse it. I hope my post shows one interesting hybrid way of using it that does not get in the way as much as the default behavior. 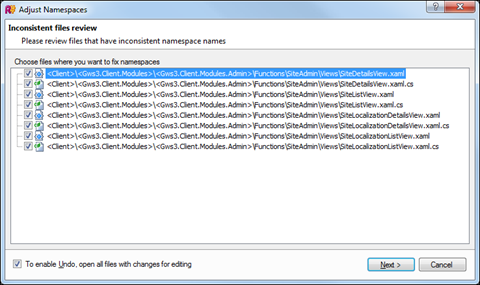 A really nice feature in Resharper 5 is the ability to adjust namespaces for code files in a directory. When you move files around in your project or between different projects the namespace no longer matches the directory structure. Updating the namespaces in the code files by hand is quite tedious and error prone. This is especially true when you move user controls or web pages that consists of a XAML file or ASP.NET page with a code behind class that needs to match. I learned a new Visual Studio trick today. I’m currently working on a hobby project in C++ and since the plan is to make it cross platform I’m using the excellent Juce framework. Juce has its own string type which is very nice. It handles Unicode, reference counting and so on. Its like the CString type but cross platform. Some people may prefer the standard lib string std::string but personally I think the std lib is a bit awkward. So what can we do about it? 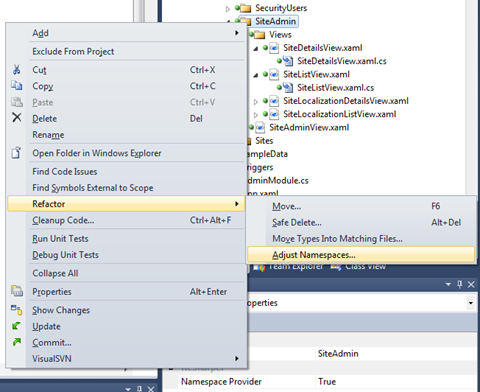 Well I found some info about a little file containing debugger settings for Visual Studio. It’s default location is under C:\Program Files\Microsoft Visual Studio 9.0\Common7\Packages\Debugger and the file is called autoexp.dat. This file controls how VS displays different types during debugging. Interesting! 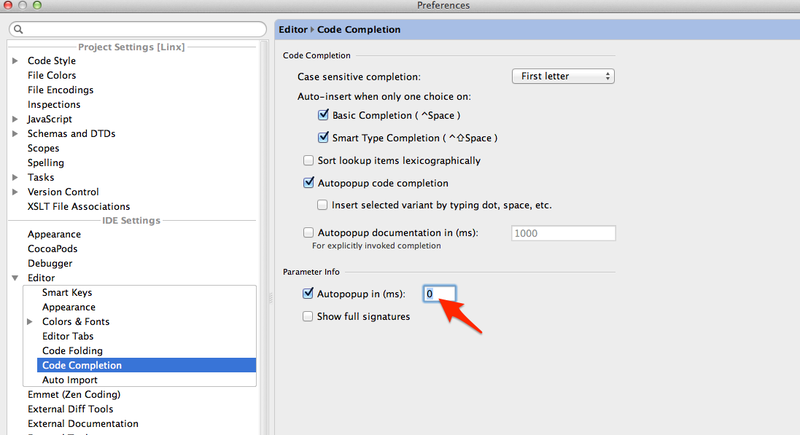 Note that you can change the autoexp.dat file anytime. It will be reloaded when the debugger starts, so you don’t have to restart VS. This will tell VS about the Juce string type and explain how we want to view it. The ‘preview’ bit controls what to show in the watch window and the ‘stringview’ bit controls the popup string viewer that allows you to view the string as text, XML or HTML. Very handy feature! The expression refers to the variable being viewed as $e and then you simply access its members as you would in normal code watch expressions. The ‘su’ part means that the value should be treated as a null terminated string in Unicode format. The ‘sub’ means that the string should be shown using “bare representation”. In this case it will display the string without the surrounding quotes (I only use this in the string viewer, as this seems to be the common practice). Neato! Now we see the strings easily while debugging. We can also click the magnifying glass to examine the string in a popup window, even show it as formatted XML. Now the Juce type is even more juicy! Great isn’t it? I’m using TortoiseSVN for source control both at work and at home. Lately I’ve been having some problems with it though because the icon overlays that show the status of files are not displayed. That kind of takes away one of the great features of the program so it quickly drove me nuts. It turned out that it was not hard to fix. After some searching I found out that the problem is that Windows only supports a maximum of 15 registered overlay icons. Of those it uses 4 itself so that leaves us with 11 icons to play with. What happens if more icons are registered? Well, those extra icons are simply not shown. According to the TortoiseSVN FAQ this is taken into consideration when Tortoise is deciding which icons to use and I’ve never had any problems with it until now. Maybe it is not working as intended when running in Windows 7 (64-bit)? So how does Windows decide which icons to use? Well there is a special key in the registry where everything can be found. 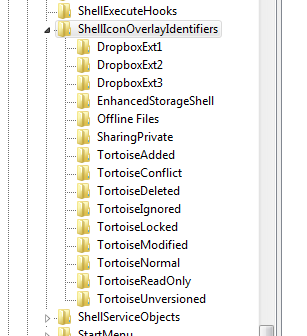 It’s under HKEY_LOCAL_MACHINE\SOFTWARE\Microsoft\Windows\CurrentVersion\Explorer\ShellIconOverlayIdentifiers. Windows reads this list in alphabetical order which is kind of lame. I have some icons from Dropbox, some from Tortoise and some other that I suspect belong to Windows or Office. It seems that this list of 15 icons should work but it doesn’t. It’s more likely that only 11 of these icons are used because I’m missing the most common Tortoise icons (Modified and Normal) which happen to fall just outside the range. The great part here is that each of these keys only contains a GUID which tells Windows where to lookup the actual icon information. In fact, we can change the names of the keys without breaking anything which gives us an easy way of rearranging the list! As you can see I renamed the icon identifiers and prefixed them using numbers which will ensure they are sorted before the other icons. 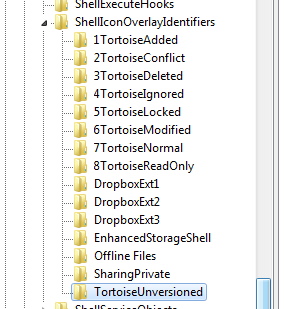 I skipped the “TortoiseUnversioned” icon because it’s usually not of interest to me. Maybe I could skip some of the other icons too but I wanted to make sure it worked first.